Home > Timing Belts MXL-XL-L-H... > XL Timing Belts. 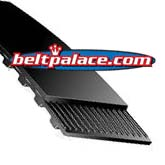 Trapezoidal Tooth Gear belts - 0.200" Pitch > 190XL025 Timing belt replaces Dayco SS48364, Dodge 464513. 190XL025 Timing belt replaces Dayco SS48364, Dodge 464513. 190XL025 Timing belt. INDUSTRIAL GRADE. 19” Length, 95 teeth, 1/4” Wide. Bando Synchro-Link Timing belt replaces Dayco SS48364, Dodge 464513. 190XL025. 19 inch Length. 95 teeth. 1/4” wide. Replacement “XL Series” industry standard Timing Belt. Popular replacement belt for electronic equipment and power tools such as power sanders, woodworking tools & lathes, pumps, and robotic equipment. 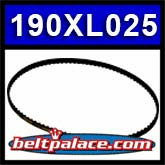 Timing Belt 190XL025 - (Metric Standard 64SS483). Dodge 464513 Synchronous Timing Belt. NSN 3030009596675 Timing Belt 190XL-025.